Or is that the LG Optimus Pro? A new flagship on the horizon, but what will it be called? 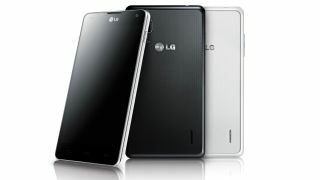 Specs have appeared online for a new smartphone dubbed the LG Optimus Pro - but is this a new handset or just the Optimus G2 in disguise? The details have cropped up on Japanese forum 2Channel, so it's not exactly the most legit leak we've ever seen, but still let's see what it's saying. According to the unknown source, the Optimus Pro will pack a 5-inch full HD display, 1.7GHz quad-core processor, 2GB of RAM, 32GB of internal storage, 13MP camera and a 3,000mAh battery. These specs are pretty similar to the rumours we've seen surrounding the Optimus G2 which has led many to believe they could be the same device. The original Optimus G didn't make it out of Asia, but we're hoping LG's next flagship handset will go global especially after the success of the Google Nexus 4. The LG Optimus G2 or Optimus Pro - or both - could arrive at MWC 2013 in Barcelona and we'll be there to bring you all the latest from the Korean firm.